On Thursday 5th of December, International Volunteers Day, the NSW Volunteer of the Year Award State Ceremony took place at The Kirribilli Club, Lavender Bay. Announced as the 2013 Senior Volunteer of the Year was Southern Cross Wildlife Care’s Dr Ralph Howard for “his tireless work with injured and orphaned wildlife.” This follows an announcement on October 29th, 2013 that Dr. Ralph was this year’s Sydney North 2013 Senior Volunteer of the Year. Southen Cross Wildlife Care (SCWC) was founded by Dr. Howard Ralph, a veterinarian with long standing wildlife specialist experience, for the sole purpose of treating and caring for injured, sick and orphaned wildlife. Dr. Ralph is well known for his passionate approach to caring for all ‘critters’ – furred, scaled, feathered, finned, and for developing methods and doses of medicines that will best suit each individual creature. This is a 24/7 voluntary commitment to ensuring he does all he can for any native animal brought to him, putting off his own retirement. Howard said "This is an honour and an important Award at a personal level, but more importantly for the wildlife that receive a really raw deal. The Award acknowledges the work that has been done (and will continue to be done) by a legion of wildlife carers and volunteers who graciously give an enormous amount of their time to the welfare of wildlife in need". Howard finished by stating ......."it should also be remembered that wildlife carers save the government (both State and Federal) a massive amount of money and time by devoting their lives to the plight of our diminishing wildlife, wildlife who should be treated with respect and compassion." The current SCWC ‘Critter of the Month’ on our Community News page illustrates the work undertaken by Dr. Ralph and the dedication required by a trained carer after Howard has done all he can – rehabilitation takes weeks and can be a costly part of a weekly ‘food budget’. 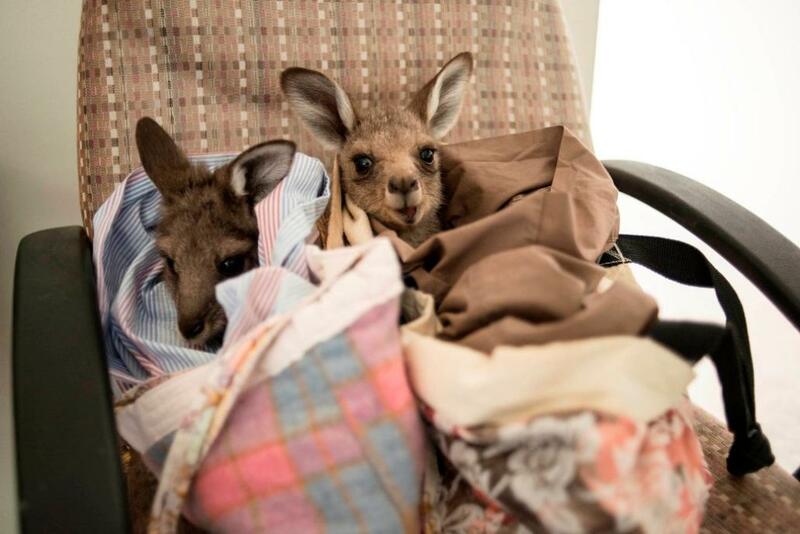 Baby critters found injured or left in a pouch by someone who has struck their mother and just driven off may require feedings, like any other baby, throughout the night. What is also not readily seen is carers are called out at all hours of the day and night and then Dr. Ralph is also ‘on duty’ for emergency operations. As we head into the Christmas Season, with many people traveling to loved ones on our roads, our wildlife is at increased risk of being struck by vehicles. If you do find an injured animal please check the pouch Hotter weather can also take its toll and carers advise to keep this in mind and place dishes of water outside for our feathered, scaled and furred garden visitors. News we ran last week regarding a new Free Wildlife Rescue App is a way to help those that help our native creatures. Apart from that, you can train to be a carer yourself through Sydney Wildlife or put your hand in your pocket and perhaps go without one or two ‘Christmas drinks’ this year and give those dollars to support SCWC or Sydney Wildlife – the costs of medicines and drugs are going up, as are the overheads of such facilities. Details for these are below. The NSW Volunteer of the Year Award program is an initiative of The Centre for Volunteering, the peak body for volunteering in NSW. Now in its seventh year, this state-wide Award program recognises and thanks volunteers in NSW who generously give more than 235 million work hours each year in NSW, contributing an extraordinary $5 billion to the State’s economy. The Award program is sponsored by the NSW Government, and Clubs NSW, the industry body which represents the state’s 1400 not-for-profit clubs, and Communities NSW. The Hon Victor Dominello, Minister for Minister for Citizenship and Communities is Patron. Joeys at Braidwood - waiting for Dr. Ralph. Wildlife Pictures courtesy Lindy Stacker, SCWC, words by A J Guesdon, 2013.